When working on any Music Production (Remix or Original), at some point you're going to need to move your clips around. In almost every project, you're going to need to do things like: Line up your Accapella track, line up your Loops/Groove Clips, syncopate a drum clip, create fills, extend the intro, add a break, the list goes on and on. While working on projects and moving clips around, I'm always in and out of the Snap Options, constantly changing the settings. Using mouse strokes can sometimes slow me down. This in-depth look at the Snap options in SONAR 4 and later is going to allow you to spend less time changing the settings and allowing more time for creativity. This will optimize workflow for both beginner and advanced users of SONAR. NOTE: All the data in SONAR is represented as "Clips". Clips can contain MIDI, audio, or Groove Clips. All settings in the Snap To Grid option apply to all Clips. The first thing we're going to cover is the Enable/Disable the Snap To Grid Icon. When off (Icon is gray): Clips will move freely. The 2nd most used is the "Mode" feature. The default (and my favorite) setting is "Move By". With "Move By" selected: Clips will move by the selected increment. BUT, relative to the grid. 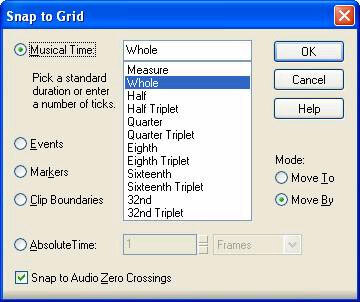 The Snap To Grid option is on, with the "Musical Time" set to "Measure" and "Move By" selected. Notice that the clip is placed about a 16th note off on Bar #1. Notice in the above example (B2) that the clip has move by 1 measure, but is placed at the same time relative to the grip (which is now a 16th off on Bar #2). This is extremely helpful when working with vocal clips. Once you have your vocals lined up with the grid, you can move them around and your vocals will still stay on beat. The other Mode setting is "Move To". The Snap To Grid option is on, with the "Musical Time" set to "Measure" and "Move To" selected. Now when I move the clip from its original location (See example B1), it will snap to the nearest measure. Notice that the clip has moved to the next measure, and snaps precisely to Bar #2. Here are some time saving step by step instructions. NOTE: It's very easy to accidentally move a clip (and not notice) by a smaller setting, like 16th notes. To avoid this, I usually set the Snap To Grid Properties back to "Measure" after every clip movement. NOTE: All time selections and drag and drop editing operations use the Snap To Grid settings. Also, the Piano Roll and other views have independent Snap To Grid features and are not affected by changes made to the project Snap To Grid options.